Following the final approval by the Central Bank of Nigeria and Securities & Exchange Commission to the proposed merger between Access Bank and Diamond Bank, the share price of Access Bank on Wednesday jumped by 9.24% to close at N6.50 from its previous close of N5.95. For five straight consecutive days, trading activities on the floor of the Nigerian Stock Exchange has been on a downward trend as the All Share Index has declined so far by 1.03% in the last five trading days. 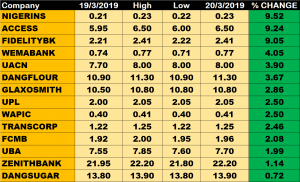 At the close of trade on Wednesday, March 20, 2019, the All Share Index declined by 0.13% to close at 31,040.84 points from the previous close of 31,082.32 points on Monday. Consequently, the Market Capitalisation closed lower by 0.13% to settle at N11.576 trillion against previous close of N11.607 trillion, shedding N15 billion. Aggregate volume and value of traded stocks closed at 223.66 million units and N2.16 billion respectively. The market breadth closed negative as 14 stocks gained while 23 stocks lost. Niger Insurance with 9.52% growth led other gainers, closing at N0.23 from the previous close N0.21. This is followed by Access Bank Plc, which gained 9.24% to close at N6.50 from the previous close of N5.95. Cutix Plc tops the decliners’ list, shedding 9.76% of its share price to close at N1.85 from the previous close of N2.05. 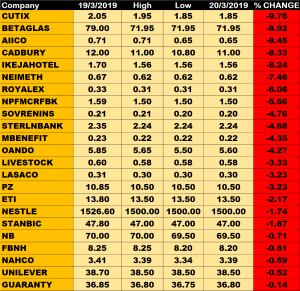 Beta Glass and AIICO Insurance among other price decliners also shed 8.92% and 8.45% of their share prices respectively. Access Bank traded the highest volume of the day to close at 83.2 million units in 504 deals, valued at N529.94 million. Zenith Bank traded about 22.45 million units of its shares in 380deals, valued at N494.67 million.